DNA Music Studio has now been open and running for about a year in the downtown Sarnia core. From what I hear the place is busy with local clients making use of this fine facility. I would love to get the grand tour of Sarnia's biggest recording studio. It is nice to finally see a decent sized studio in our community. So far the studio has been steady with work. 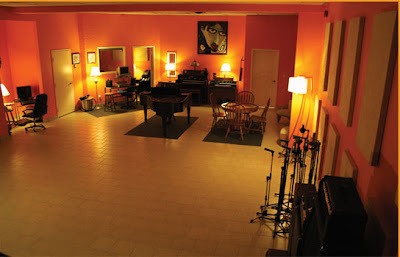 I would love to get a chance to go into the studio and do some recording of myself playing on the baby grand piano. Their is something special about playing a real, acoustic grand piano as opposed to playing keyboard samples on a synth. I would also like to work on some acoustic, 12 string guitar stuff that would work with the acoustic piano ideas. I have this idea for an instrumental song with parts for piano, acoustic guitar, lead electric guitar, strings, bass, and drums. I believe it would be beneficial to record in a real recording studio where everything is setup. Check out a couple of pictures of the studio setup below.